Hüffmeier, Annette. “The CBGM Applied to Variants from Acts.” TC (2015): 1-12. Mink, Gerd. “Contamination, Coherence, and Coincidence in Textual Transmission: The Coherence-Based Genealogical Method (CBGM) as a Complement and Corrective to Existing Approaches.” Pages 141–216 in The Textual History of the Greek New Testament: Changing Views in Contemporary Research. Edited by Klaus Wachtel and Michael W. Holmes. Text-Critical Studies. Atlanta: SBL, 2011. ———. “Eine umfassende Genealogie der neutestamentlichen Überlieferung.” NTS 39 (1993): 481–499. ———. “Problems of a Highly Contaminated Tradition: The New Testament: Stemmata of Variants as a Source of a Genealogy for Witnesses.” Pages 13–85 in Studies in Stemmatology II. Edited by Pieter van Reenen, August den Hollander, and Margot van Mulken. Philadelphia: John Benjamins, 2004. ———. “Was verändert sich in der Textkritik durch die Beachtung genealogischer Kohärenz?” Pages 39–68 in Recent Developments in Textual Criticism: New Testament, Other Early Christian and Jewish Literature: Papers Read at a Noster Conference in Münster, January 4–6, 2001. Edited by Wim Weren and Dietrich-Alex Koch. Studies in Theology and Religion. Assen: Royal Van Gorcum, 2003. Wachtel, Klaus. “The Coherence-Based Genealogical Method: A New Way to Reconstruct the Text of the Greek New Testament.” Pages 123–38 in Editing the Bible: Assessing the Task Past and Present. Edited by John S. Kloppenborg and Judith H. Newman. Resources for Biblical Study. Atlanta: SBL, 2012. ———. “Towards a Redefinition of External Criteria: The Role of Coherence in Assessing the Origin of Variants.” Pages 109–27 in Textual Variation: Theological and Social Tendencies? Papers from the Fifth Birmingham Colloquium on the Textual Criticism of the New Testament. Texts and Studies: Third Series. Piscataway, NJ: Gorgias, 2008. Strutwolf, Holger. “Scribal Practices and the Transmission of Biblical Texts: New Insights from the Coherence-Based Genealogical Method.” Pages 139–60 in Editing the Bible: Assessing the Task Past and Present. Edited by John S. Kloppenborg and Judith H. Newman. Resources for Biblical Study. Atlanta: SBL, 2012. Wachtel, Klaus, and David C. Parker. “The Joint IGNTP/INTF Editio Critica Maior of the Gospel of John: Its Goals and Their Significance for New Testament Scholarship.” Paper presented at the SNTS meeting, Halle, 2005. Wasserman, Tommy. “Historical and Philological Correlations and the CBGM as Applied to Mark 1:1.” TC (2015): 1-11. ———. “Criteria for Evaluating Readings in New Testament Textual Criticism.” Pages 579–612 in The Text of the New Testament in Contemporary Research: Essays on the Status Quaestionis. Edited by Bart D. Ehrman and Michael W. Holmes. 2nd ed. Leiden: Brill, 2013. ———. “The Coherence Based Genealogical Method as a Tool for Explaining Textual Changes in the Greek New Testament.” NovT 57 (2015): 206–18. Do, Toan. “Mόνον or Μονῶν? Reading 1 John 2:2c from the Editio Critica Maior.” JBL 133, no. 3 (2014): 603–25. Flink, Timo. Textual Dilemma: Studies in the Second-Century Text of the New Testament. University of Joensuu Publications in Theology. Joensuu: University of Joensuu, 2009. Alexanderson, Bengt. Problems in the New Testament: Old Manuscripts and Papyri, the New Coherence-Based Genealogical Method (CBGM) and the Editio Critica Maior (ECM). Acta Regiae Societatis Scientiarum et Litterarum Gothoburgensis, Humaniora. Göteborg: Göteborg, 2014. Wow. That is outstanding. The blog that keeps on giving. So--negligent scribes skipped over a negation, reversing the meaning in every single extant manuscript, but they didn't skip from ἡ to ἡ or from ἐν to ἐν at the other end of the verse in a few early manuscripts? 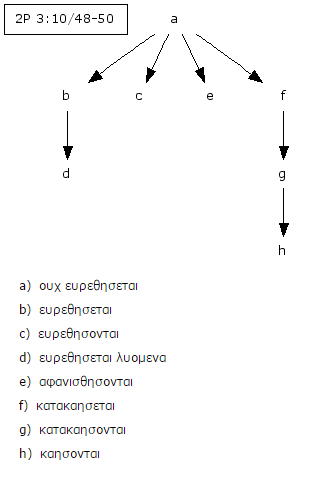 οὐχ εὑρεθήσεται doesn't even make sense with the rest of the sentence. Adding that οὐχ is clearly just someone pushing a doctrinal agenda. Thanks a lot for this index. I'm still trying to grasp the exact implications of the CBGM. These examples will be very helpful. If I'm not wrong, a "Studienband" (volume with accompanying studies) is upcoming for the ECM edition of the Catholic Epistles. It is mentioned in the preface of the ECM (Catholic Epistles; 2nd edition) on pages VII (German) and XII (English) (dated December 12, 2012). The editors stated: "A third volume with accompanying studies will follow in the not too distant future." Does anyone know more about this volume, because it will increase this index immensely. Ernst, the textual commentary has been promised since the very first fascicle in 1995. They even described it in the present tense: “In einem textkritischen Kommentar werden alle schwierig überlieferten variierten Stellen besprochen. // A textual commentary discusses all passages where difficulties are found in the textual tradition” (ECM1, pp. 1*, 11*). That was written 20 years ago and while I know the editors would like to do something like this, I doubt they will manage to find the time. Thanks! In that case, this blog underlines the urgency of such a textual commentary! "In einem textkritischen Kommentar werden alle schwierig überlieferten variierten Stellen besprochen." "In einem textkritischen Kommentar werden alle schwierig überlieferten variierten Stellen besprochen werden." I deleted the spam comment, but that meant that the reply to the spam comment was also deleted. No, it had properly embedded links etc. Clearly not me.